Washington, NJ: A new, eco-friendly vibrating fluid bed dryer from process equipment manufacturer The Witte Co., Washington, New Jersey (www.witte.com), features a proprietary design that generates process heat using a blend of natural gas and the biogenic methane biogas. Developed for the Gulf Coast Agricultural And Seafood Co-Op seafood processing facility, Bayou La Batre, Ala. in partnership with the U.S. Department of Commerce, the energy-efficient fluid bed dryer keys a system that is to convert shrimp and crab hull waste into organic fertilizer while powering itself with a free source of energy by harnessing the biogas generated during the decomposition of the seafood feedstock. The bio-gas is stored in holding tanks on-site for pumping to the dryer system’s gas-fired burner. After the seafood waste is dewatered through a screw press, the bulk dryer is to accept the viscous material as a continuous flow, even it into a single layer and reduce its moisture content to the required specification. The dried, granular waste is then to be packaged and containerized for sale as a nutrient-rich fertilizer to a variety of poultry, dairy and other agricultural operations. 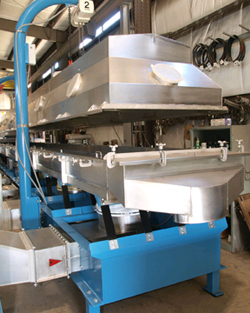 Slated to process up to 5,500 tons of waste annually and capable of 24/7 operation, the environmentally sustainable fluid bed drying system is to enable Alabama seafood processors to transform their costly waste into valuable product while diverting the material from the landfill and eliminating their disposal fees.